Mel Shah, owner of an upscale cigar and wine lounge in Palm Springs, California, is the man behind Bombay Tobak. 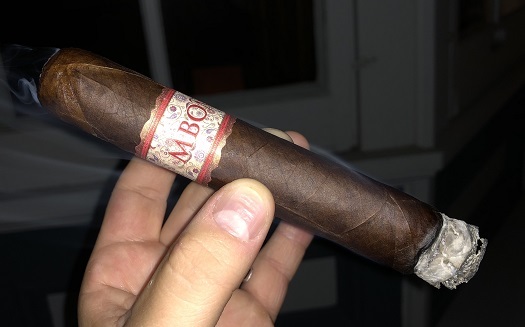 You may be more familiar with the name MBombay, though, which is his small-batch brand of high-end cigars made in Costa Rica. When I think of MBombay, I think of Gaaja and Gaaja Maduro. I love both cigars—especially Gaaja Maduro, which earned a rare five stogies out of five rating in February 2017. The original MBombay line, however, is probably what first comes to mind for most. It includes Classic, Habano, KẽSara, Mora, and Corojo Oscuro. The latter sports a beautiful, dark, oily, mottled, slightly reddish Ecuadorian wrapper around tobaccos from Ecuador, Peru, and the Dominican Republic. It is adorned with an ornate, eye-catching band. I smoked a handful of Corojo Oscuro Gordos for this review. This vitola retails for about $11 and measures 6 inches long with a ring gauge of 60. The cap clips cleanly to reveal a cross-section of tightly packed tobaccos, yet the cold draw is nice and smooth. At the foot, I find pre-light notes of dark chocolate and molasses. The initial flavor is full-bodied and aggressive with strong notes of espresso and black pepper spice. Quickly, though, the breaks are pumped and the Gordo settles into the medium-bodied range. Here, I find flavors ranging from roasted peanut and cereals to coffee and cedar. In the background, there’s a gentle cayenne spice and a sensation that reminds me of sunflower seeds. I’ve never been a big fan of the over-sized gordo format. For one, the ring gauge is too thick to be comfortable, and that same girth can also water down the flavors that would otherwise be more concentrated. Additionally, many of these cigars tend to overstay their welcome. And they can also suffer from combustion issues. The physical properties of the Corojo Oscuro Gordo, however, are admirable. The burn stays even and requires only a few touch-ups. And the ash holds firm. But the other disadvantages I mentioned are present here—and I think that’s more of an indictment of the size (generally speaking) than this particular cigar. Still, MBombay chose to offer the format, and I must review the cigar as it is presented. Taking into account my dislike for the size, as well as my enjoyment of the balanced, complex blend, I’ve arrived at a rating of three stogies out of five. Never been a fan of the 60+ ring gauge either, although, I’ve smoked a couple that were pretty good. Undercrown Shade comes to mind. Smoked my first Gaaja natural last week and holy crap, what a great cigar. I have smoked the Mbombay Habano in petite robusto, I believe the size is, with mixed results. I’ve sorta steered away from Mbombay until my son talked me into the Gaaja. I will give the Gaaja maduro a try, but probably stay away from the big rings. Thanks for the review.